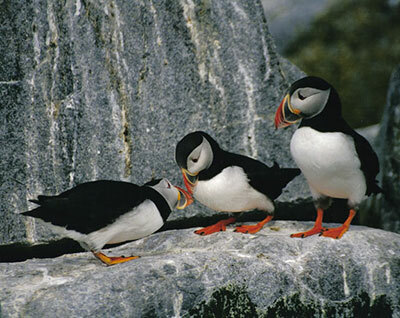 Come on a puffin & nature cruise! Every time we steam out of Port Clyde, Maine harbor, we know we’ll encounter some intriguing wildlife amid the stunningly beautiful seascapes that surround us. We’ll take you out to Eastern Egg Rock off the coast of Maine to see an Atlantic puffin nesting site and learn about Audubon’s Project Puffin, a model for restoring seabird populations all over the world. We also keep a lookout for other nature sightings. Have you ever watched a family of harbor seals frolic in the shallows? Or seen a pair of porpoises speed through the water, or a minke whale rise from the surface in a slow arc? On this 2 ½ hour cruise, you will encounter a variety of other sea creatures. As we go along, we always provide expert commentary on all that we see, including the area’s rich lobstering history and nature. Watch and learn as we haul a lobster trap just as lobstermen have done for centuries. This cruise always receives rave reviews from passengers of all ages.